Something huge and hungry stalks the Cloutsdown Fen. In northern Cygnar, the Gnasir make their living fishing the marsh. But when they become the prey of a savage monster thought to be little more than a legend, they are forced to turn to outsiders to save their people from the relentless horror. 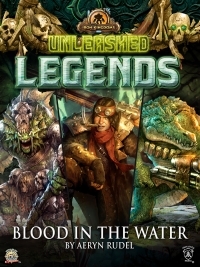 An unlikely trio assembles to combat the menace: the bog trog mystic Lurk, the gatorman sharpshooter Longchops, and the famous monster hunter Alten Ashley. In the end, they may not be able to save the Gnasir—in fact, they may not even be able to save themselves. Continue the adventures of Longchops and Lurk in the Iron Kingdoms Unleashed Adventure Kit, available now!